Remember when I asked about the baby carriage-scooter-sidecar combination I swore I had seen? Well as you can see, it DID exist. As a crazy promotion for Lambretta back in the 50s. 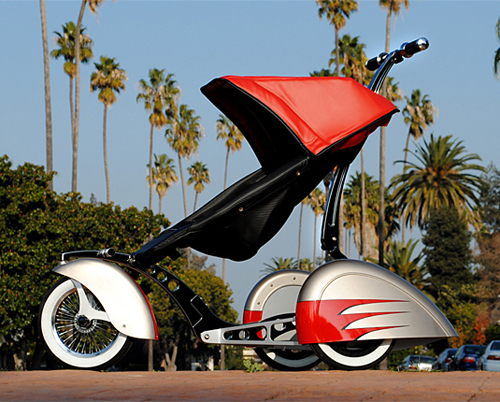 It features “two rear and one front chrome wheels with fin-shaped fenders and white wall tires, color-matching brakes, wheel bullets, chassis, seat, and top, stainless steel hardware, chrome grips, an ultrasuede seat insert for comfort and carbon vinyl leatherette for the seat and top for added durability.” Or you can order one with a “Trike Kit” at $2,500 and transform the stroller into a trike when your kid is ready to take the wheel. Thanks to Doughnut for this find! 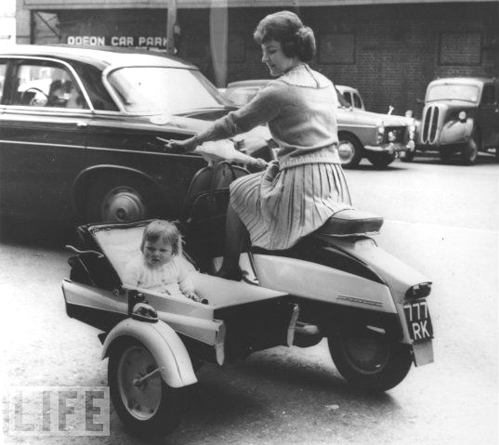 This entry was posted in Advertising, Miscellaneous and tagged Baby Stroller, lambretta, scooter, Vintage Advertising by Tracy. Bookmark the permalink.